Horrific details are emerging of atrocities carried out in a Christian town in Syria, where 1,500 families were held hostage and 45 were killed, including two teenage boys, their mother and three of their grandparents who were thrown down a well. 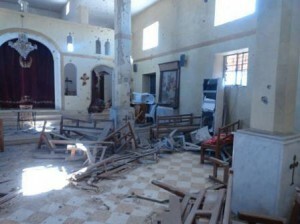 Inhabitants of Sadad, near Homs, who fled the largely Syrian Orthodox town when rebels attacked last month, are now returning home to discover the scale of atrocities in what is being seen as the worst act of anti-Christian persecution since the war in Syria began. The reports, sent by Church leaders to Catholic charity Aid to the Church in Need, describe how, in this ancient Christian town mentioned in the Bible (Ezekiel), vulnerable people unable to escape – including the elderly, disabled, women and children – were subjected to torture, such as strangulation. Reports state they were thrown down a well on 26th October along with the boys’ paternal grandmother, 90-year-old Mariam. Their funerals, which took place on Monday, 4th November, came as a community, whose town dates back to 2000BC, begins to grieve the loss of those being described as “martyrs” by Church leaders. 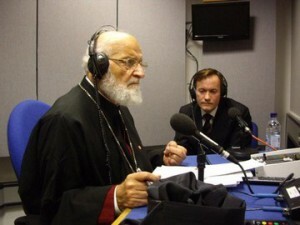 In an interview with Aid to the Church in Need, Melkite Greek Catholic Patriarch Gregorios III of Damascus described the atrocities in Sadad as “bestial”. Highlighting the murder of the family thrown down the well, Patriarch Gregorios said: “How can somebody do such inhumane and bestial things to an elderly couple and their family? The tragedy in Sadad began on 21st October when rebel forces invaded the town and carried out what Syrian Orthodox Archbishop Selwanos Boutros Alnemeh, Syriac Orthodox Metropolitan of Homs and Hama, told Fides (31/10/13) was the “most serious and biggest massacre of Christians” since the conflict began in Syria in March 2011. At least 2,500 families fled with no more than the clothes they were wearing to Homs, 37 miles (60 km) away, and further afield to Damascus, Al-Fhayle, Maskane, Fayrouza, Zzaydal and elsewhere. Some who escaped travelled 8km by foot to find shelter. Those unable to flee Sadad were quickly rounded up by the rebels as part of a bid to fend off counter-attack by forces loyal to Syria’s President Bashar Al Assad. In the days that followed at least 30 were wounded and 10 are reported still missing. Accounts from Archbishop Alnemeh and other Church leaders described widespread looting and destruction of shops, homes and government buildings as well as the state hospital, clinic, post office and schools. According to reports, youngsters described receiving taunts and insults against their Christian faith and obscene words were written on church artefacts. Sadad, where Aramaic, the language of Jesus Christ is spoken, has up to 14 churches, one of which, the Syriac Orthodox Church of St. Theodore, which was used by the rebels, who desecrated it. Last month Patriarch Gregorios visited the UK as the guest of Aid to the Church in Need, calling for peace in Syria and action for persecuted Christians in meetings with government ministers, parliamentarians, the media, Church leaders and Christian communities in London and Glasgow. Today Patriarch Gregorios will be in Augsburg, Germany to take part in a discussion panel, organised by Aid to the Church in Need, about the current situation in Syria. Aid to the Church in Need is an international Catholic charity under the guidance of the Holy See, providing assistance to the suffering and persecuted Church in more than 140 countries.